The Houston international film & video festival opens today with a screening of "Paradise Texas" starring Timothy Bottoms. The festivities will commence at 6:15 pm. tonight at the AMC 30 on Dunvale in Houston. A mariachi band will perform, bagpipers will play, there will be an artcar exhibition, and they have asked me to do some sort of fly by, either in the PPG unit, or with the RC PPC. With the conditions, and population in that area, I think it will be the RC unit making a few passes in the parking lot. 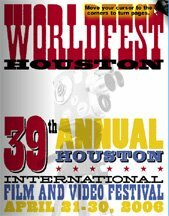 Don't miss the only screening of "Into the Wind" at Worldfest - Saturday April 22nd @ 5:00 pm.